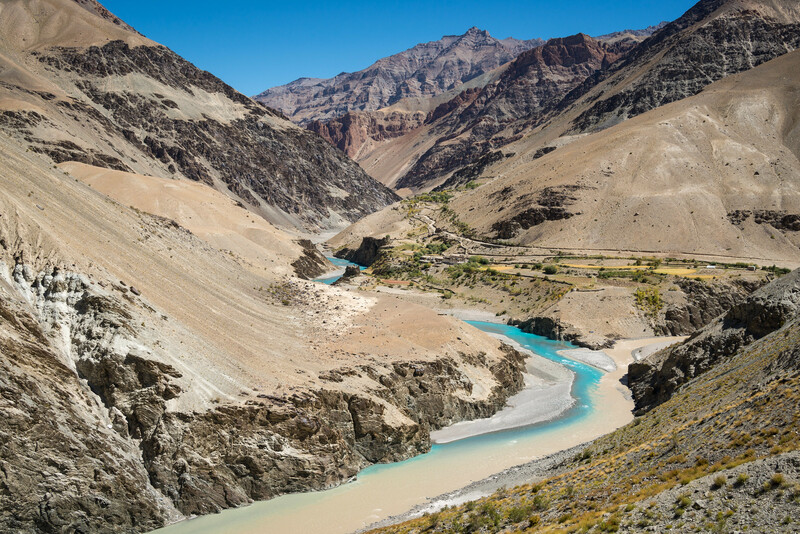 A bicycle journey around Ladakh: Part 2, out of Zanskar over Shingo La – Ouestef? 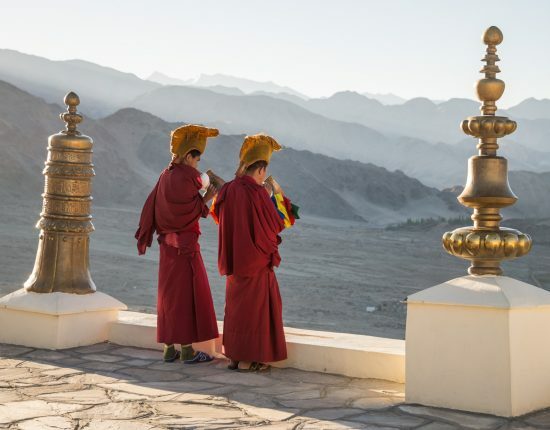 Having cycled from Leh to Padum non-stop for eight days, it was time for a short break in the Zanskar capital. 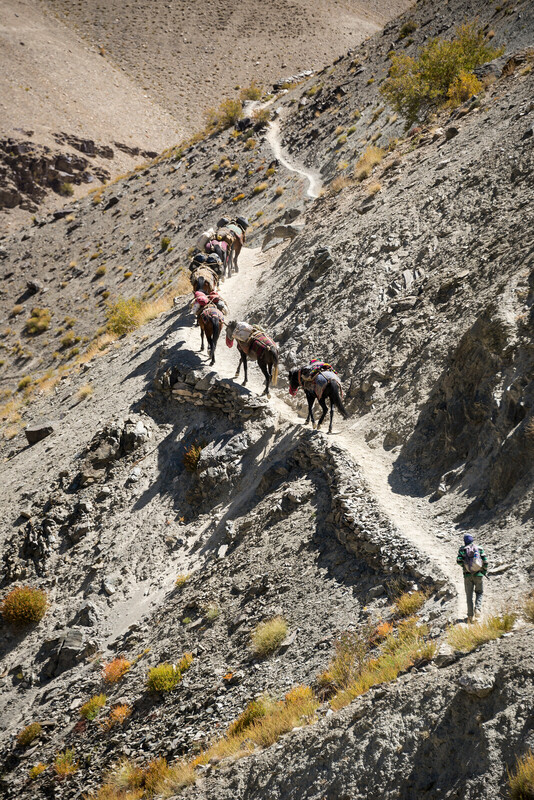 As well as providing some much needed rest for the legs, this day off would be spent trying to find some medicine to fix my stomach problems but most importantly some horses to help us hike out of the Zanskar valley over Shingo La, the first 5000 m pass of this journey. 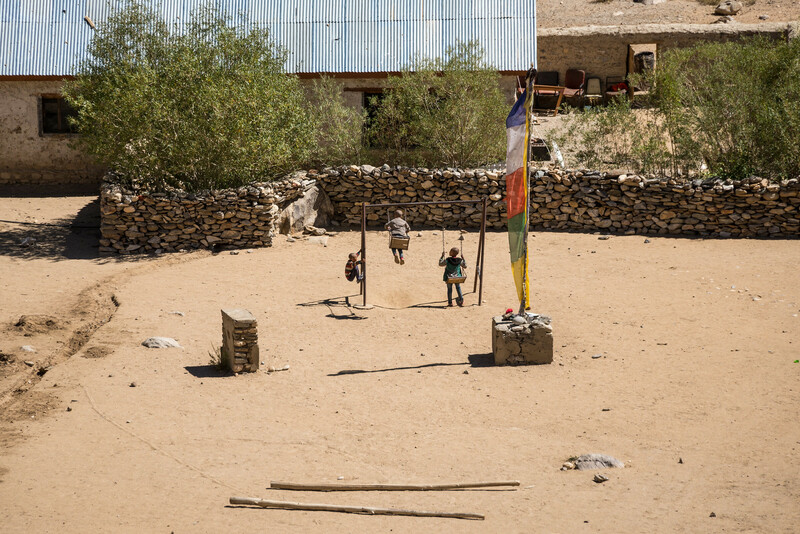 We arrive in Padum and spend quite some time looking for a place to stay, but none of them really appeal to us. On the main street we bump into motorbikers we met in Rangdum and they recommend a good restaurant for lunch. The search for a guesthouse will have to wait, we are starving. Marianne and Arian, the two Dutch cyclists from Rangdum, are already sitting inside. From the restaurant’s window I spot Nico and Ant arriving on their motorbikes. 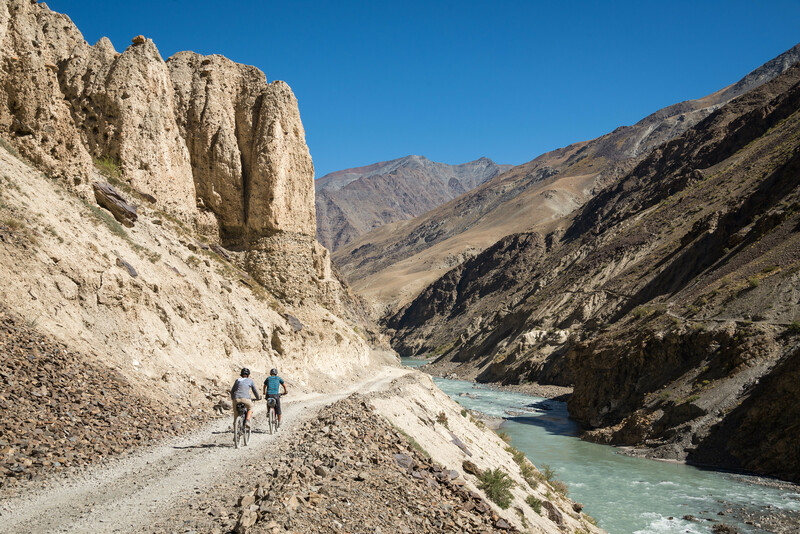 As they park next to our bikes another cyclist arrives on a very light-looking mountain bike: Peter is an English bikepacker exploring the mountains of Ladakh for the third year in a row after having already cycled here in 2014 and 2015. 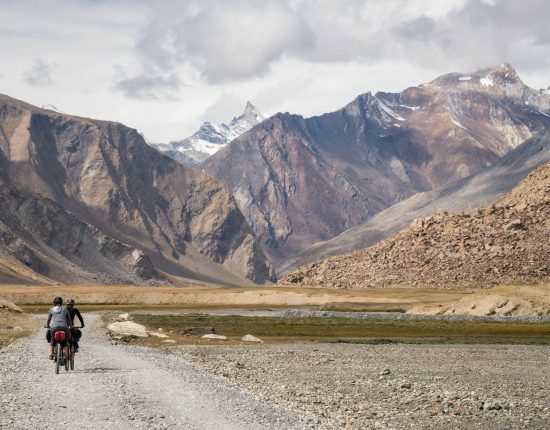 He carries only the strict minimum and takes his bike to places that only hikers normally get to explore. Peter is a legend. After lunch we check in at the picturesque Mont Blanc Guesthouse for two nights. The house beautifully decorated in traditional Ladakhi style and the rooms are big, bright and clean. The perfect place to have a rest day. I have now had diarrhea for five days in a row so Brigitt and Ivo suggest I try to buy antibiotics somewhere in town. 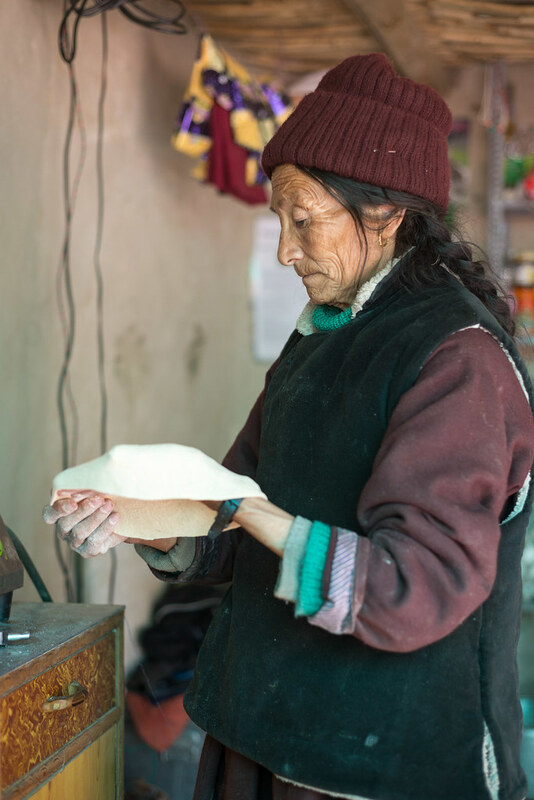 There is one tiny pharmacy in Padum and luckily it has some in stock. I’m not entirely sure what all the chemical compounds listed of the box will do to me, but Ivo ensures me that the most important one is there, and to be honest by this point I am willing to try anything. So I buy a box of five pills for the extortionate price of fifty cents, no prescription needed. I wake up early the next morning to answer the call of nature and can’t fall back asleep. 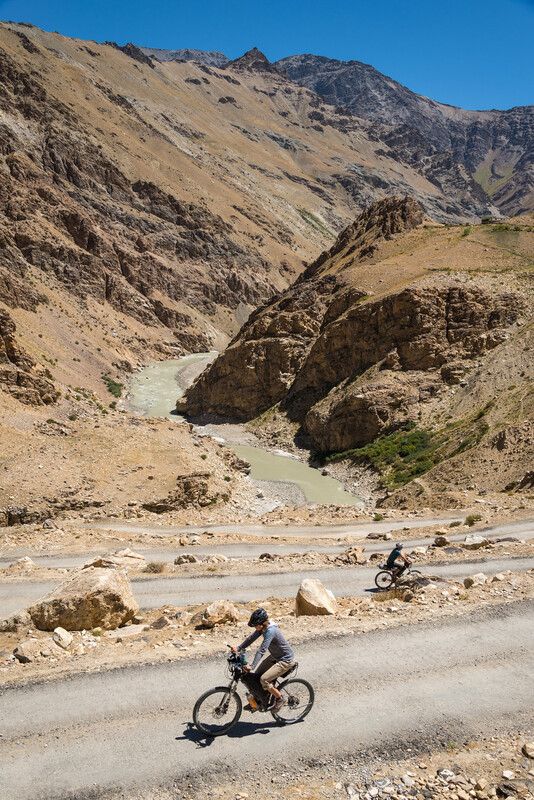 That’s always frustrating when it happens on your day off… But it allows me to see Ant and Nico one more time before they ride off back to Leh. Brigitt and Ivo are still asleep and I’m starving, so I have breakfast on my own. 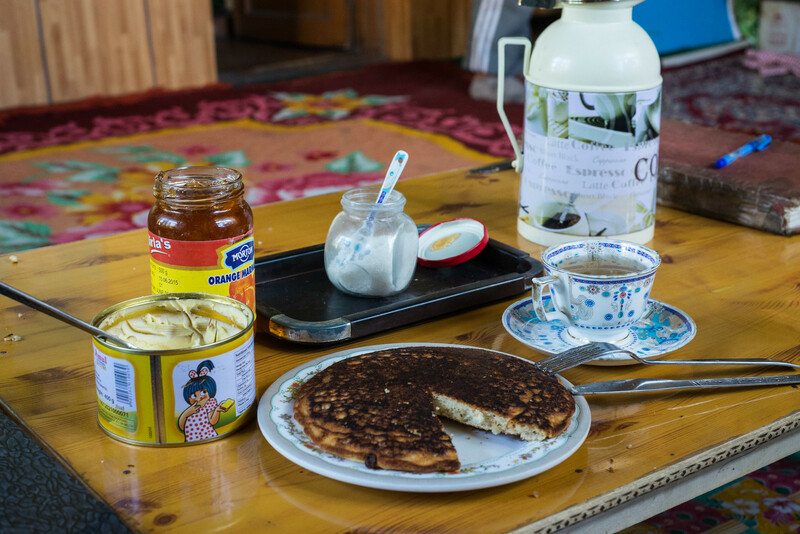 It consist of one big pancake accompanied by butter, delicious apricot jam and honey. I ask for seconds. 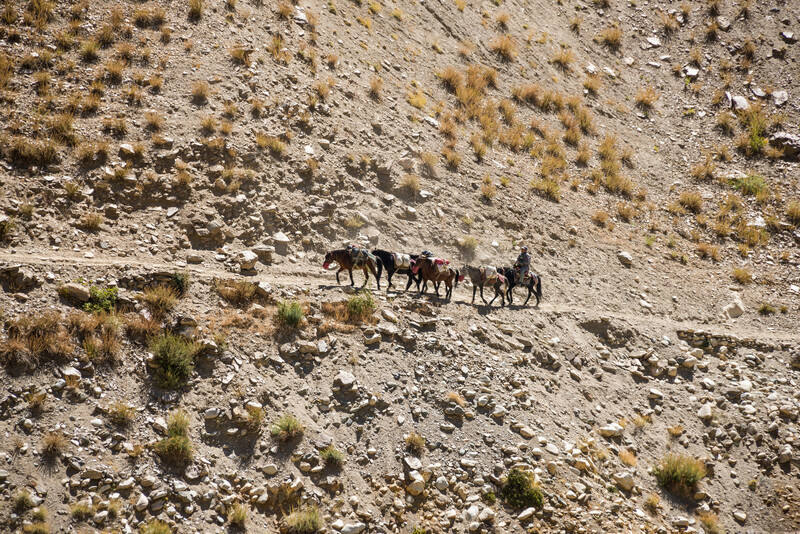 Around lunchtime we all head into town to buy some food supplied but most importantly to find a horseman and some horses for the Shingo La crossing. 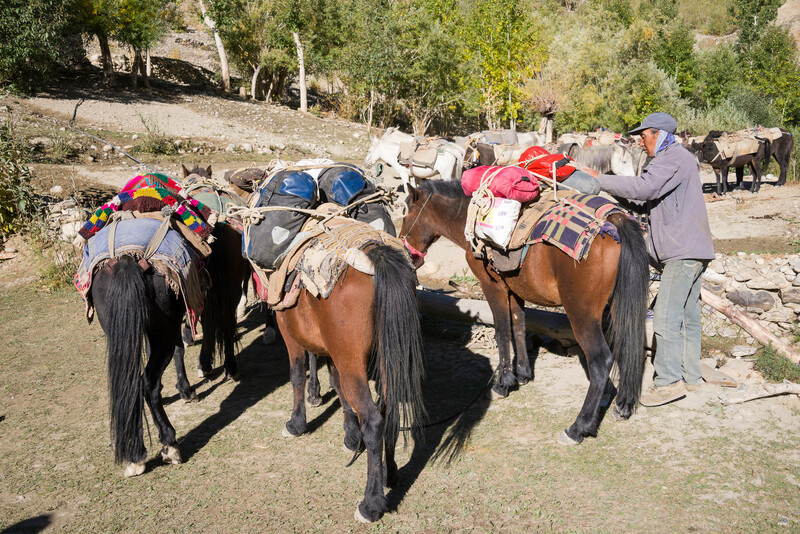 Our first stop is a travel agency, where a man tells us that finding horses might be difficult at this time of year because villagers in the valley need them for the harvests. He needs to make some phone calls and tells us to come back later in the afternoon. We go back to our favorite restaurant for lunch. Halfway through the meal a man sits down next to us and orders some food too. He overhears our conversation and introduces himself as Stophel. 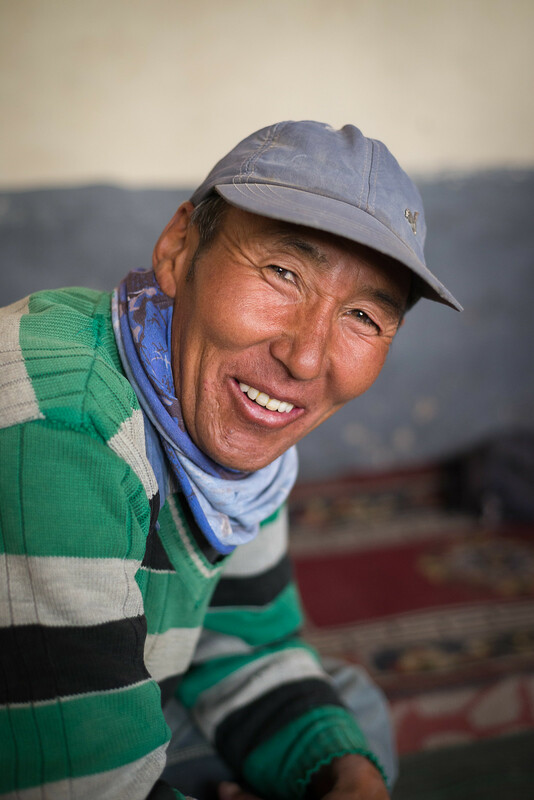 He’s friendly, funny, speaks fairly good English and, what a coincidence, owns six horses. It turns out he just finished a hike with a group of tourists and is heading back home to Shi, which is in the direction we are headed. All three of us have a good feeling about him, so after some bartering we agree to rent two of his horses for six days. Sometimes things just work out. We wake up early the next day in order to drop off our bags with our horseman before he leaves. He has to walk forty kilometers to Tsetang, our meeting point at the end of the day, so understandably he doesn’t want to hang around in Padum longer than he needs to. 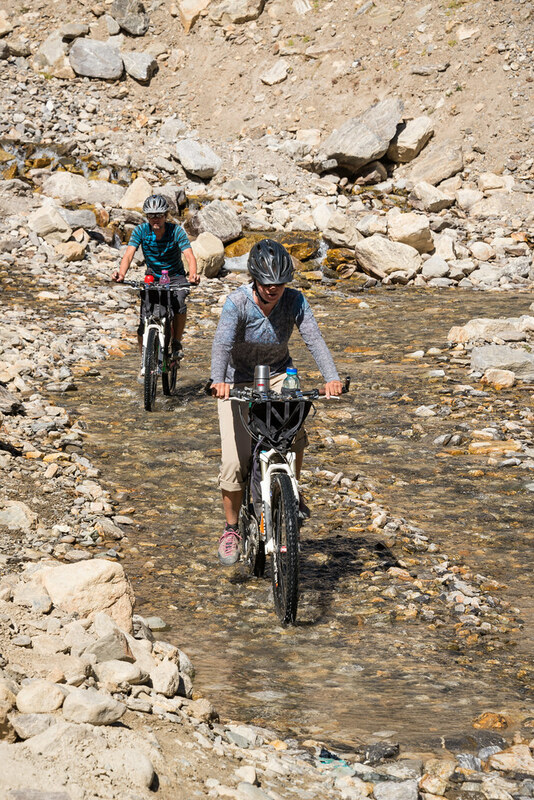 After some more delicious pancakes, Brigitt, Ivo and I get back on the saddle, making our way south into the deep and arid eastern Zanskar valley, formed by the Tsarap river. My legs feel rested and strong today, making the riding easy. I guess not having to carry my panniers has something to do with it too. The road, which initially follows the (true) left side of the river, alternates between excellent chunks of tarmac and horrendous sections of dust at least four inches deep. Soon my shoes disappear under a thick layer of maroon powder. 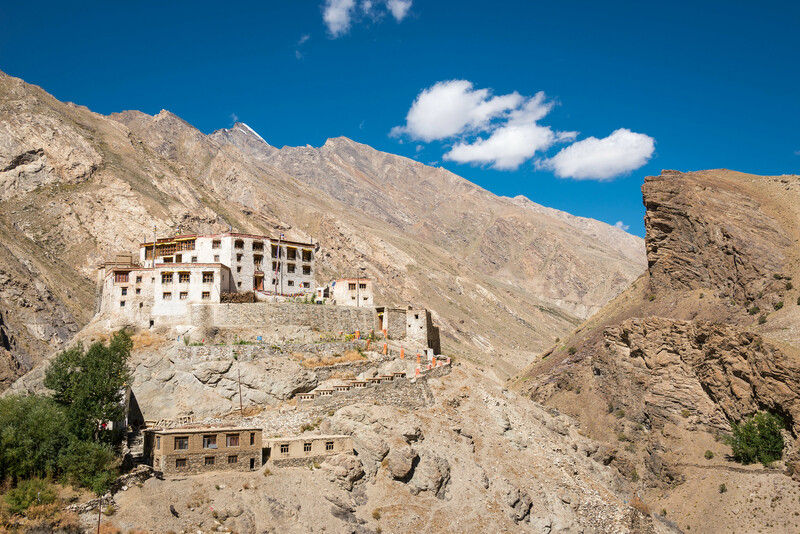 We take our first break at the Bardan Gompa, one of the first buddhist monasteries to be built in Zanskar back in the 17th century. Inside the small temple a lone monk is reciting prayers while mechanically beating on a drum. Ivo and I observe him for a while, unfortunately women are not allowed inside so Brigitt has to wait by the door. 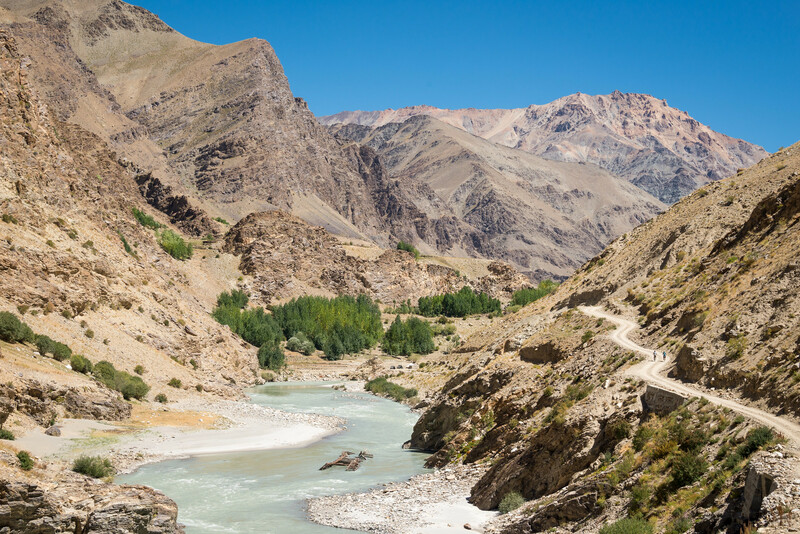 Shortly before the village of Ichar the road crosses a bridge to the other side of the Tsarap river. Soon we spot Stophel and his horses, who have stayed on the left bank and are making good progress on a narrow track cutting through the steep mountain side. 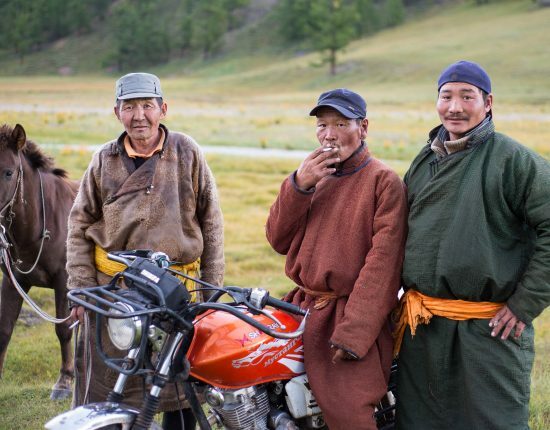 We also catch up with Marianne and Arian and the five of us ride together until we reach Tsetang. But let’s cross that bridge when we come to it, we tell ourselves, and concentrate first on… crossing the actual bridge. Stophel had warned us about it and suggested we ask some locals to help us carry our bikes across. 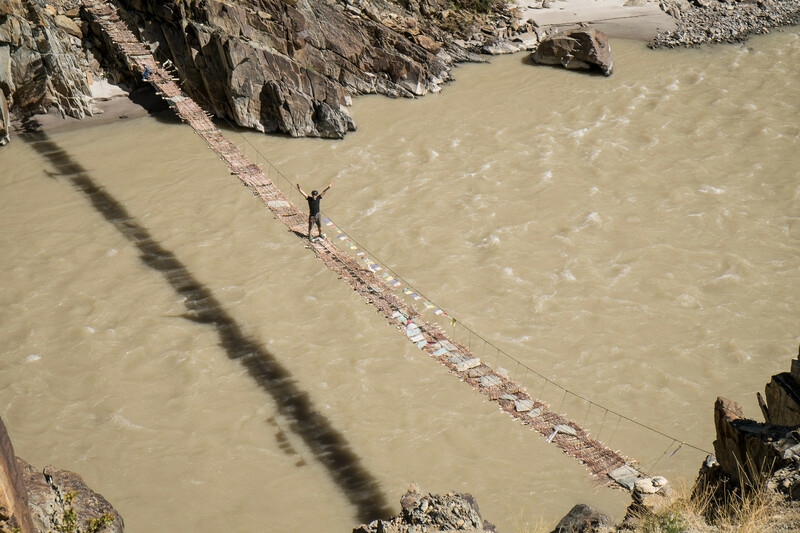 The bridge is indeed quite wobbly and hard to cross without holding onto the cables on both side. But I am a proud man, god dammit! I attempt a first trip to the other side with my backpack and camera bag, then successfully bring the bike across by pushing it slowly with one hand and carefully holding onto one of the cables with the other. 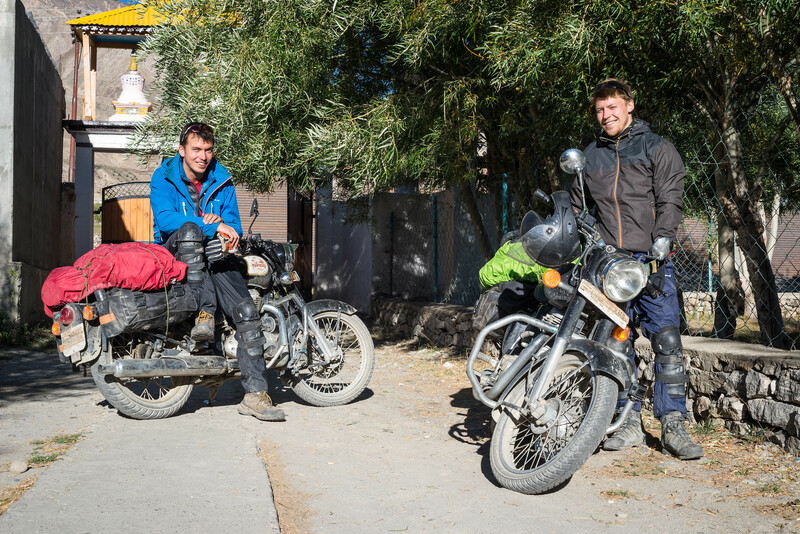 Ivo and Brigitt value their bikes more than their ego and decide to pay a local guy to take their equipment across. He picks up each bike and carries it across as if it was the most natural thing in the world, without even holding onto anything. My effort must have looked pretty lame in comparison. We begin pushing and carrying our bicycles up the slope and as expected can’t figure out a way to circumvent the landslide. 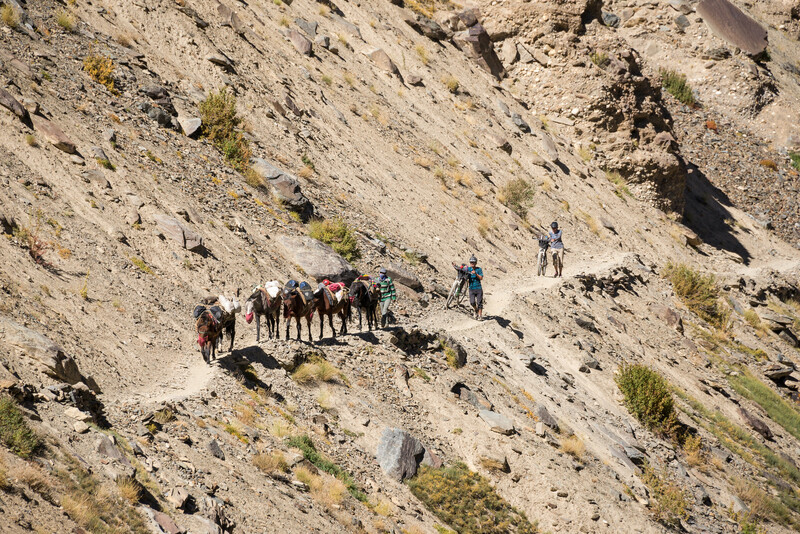 Luckily Stophel our horseman, who must have been wondering what was taking us so long, comes to our rescue and leads into the village along a hidden narrow single track. 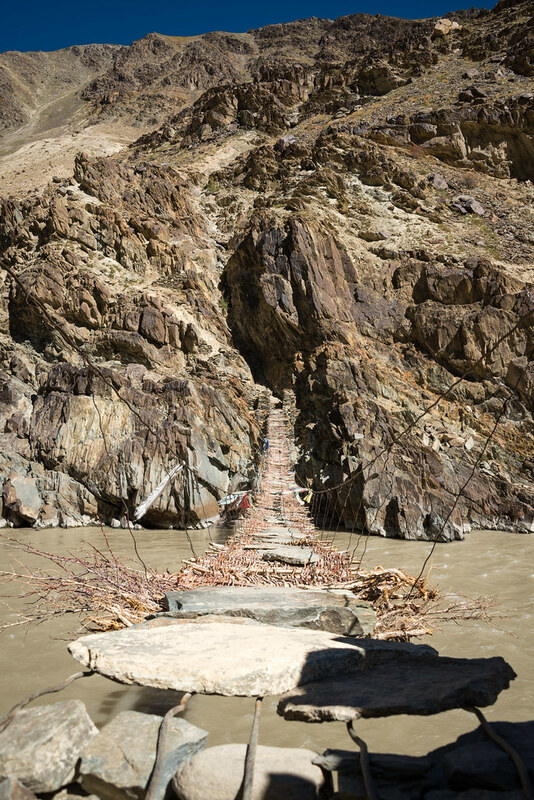 The wide track that left Tsetang soon turns into a narrow single trail with quite a steep drop on one side. Oh how much fun I would be having right now if I was riding a mountain bike. It’s still an enjoyable ride on my touring bike though, but sometimes the trail gets too rough to continue and I have to push. 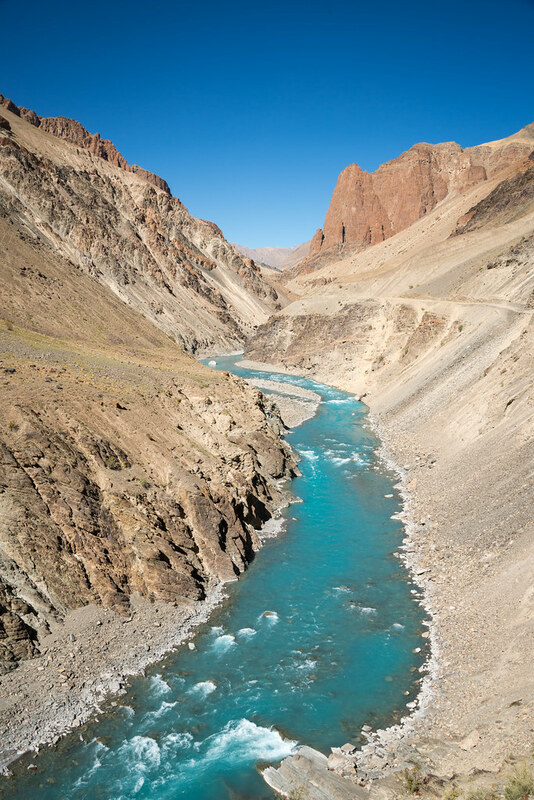 Soon we arrive at the village of Purne, where the muddy brown Kurgiak river joins the turquoise blue Tsarap river. 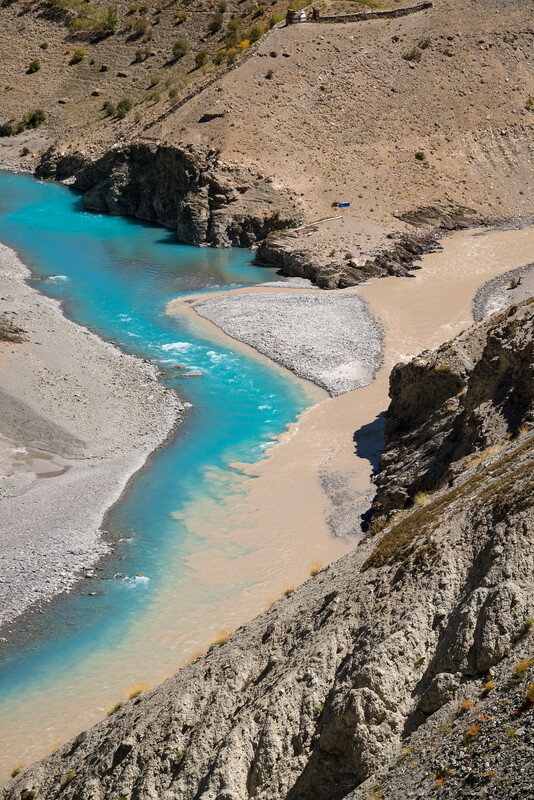 The two colours mixing together at the confluence are a beautiful sight. 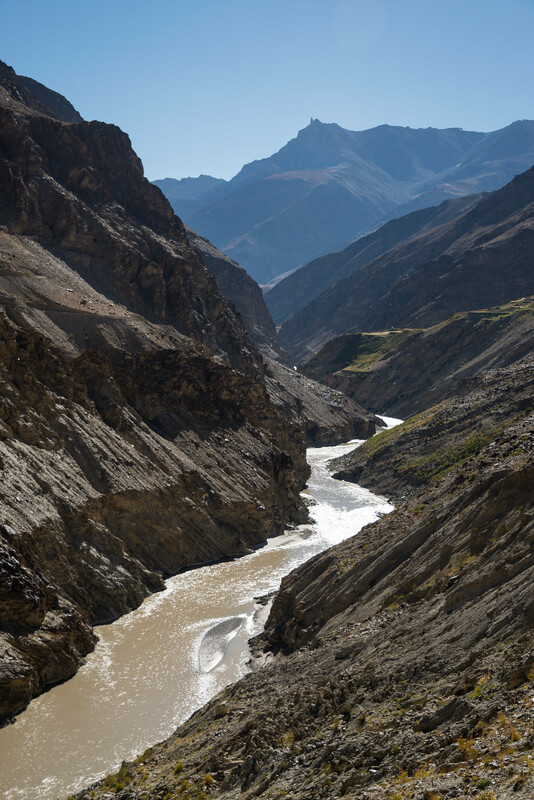 We leave the Tsarap valley and now start following the Kurgiak river instead. After half a kilometre I see Peter the Englishman pushing his bike up a steep track coming from the bridge to Purne. 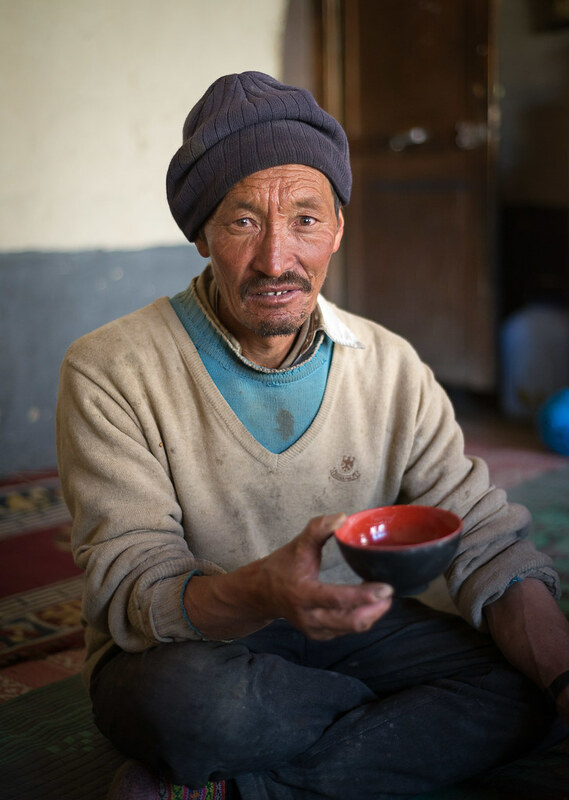 He’s just come back from Phuktal Gompa and looks exhausted. 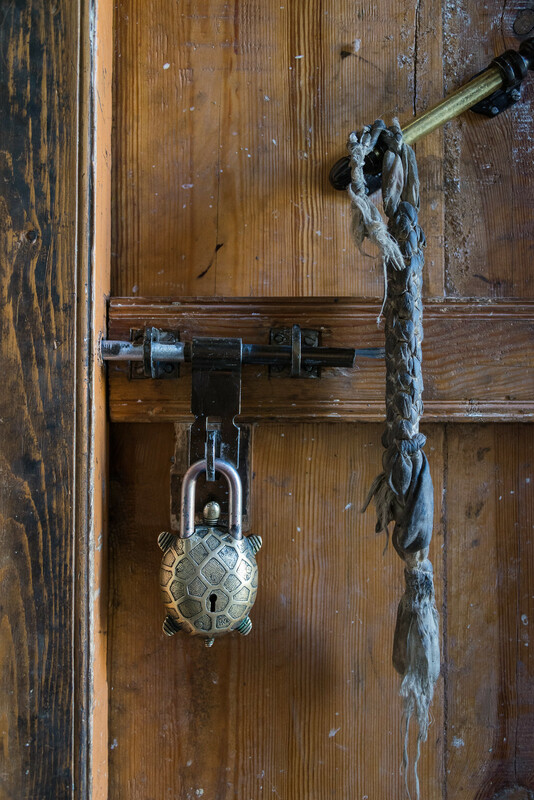 We reach the tiny settlement of Yal and Stophel unloads our equipment from the horses and lets us pack our backpacks before hiding the bikes and our panniers under a tarp. 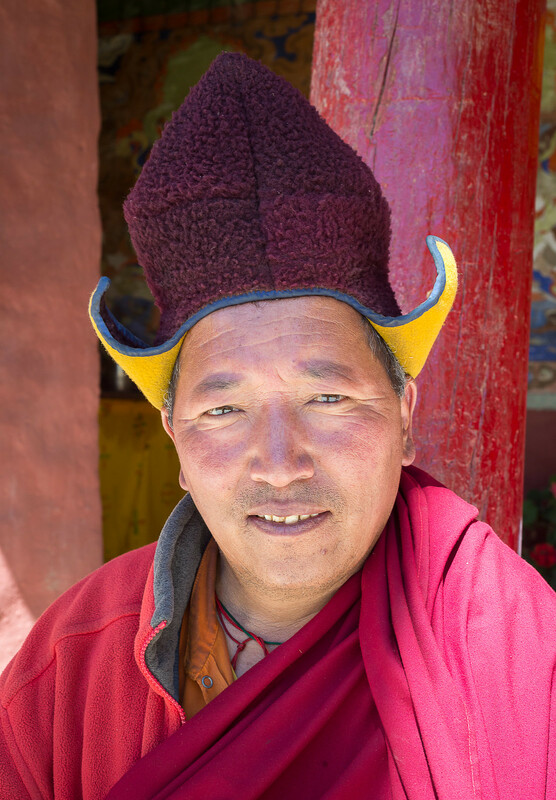 He will spend the night here and wait for us to come back from our hike to the Phuktal monastery. The man whose house our horseman will sleep in tonight agrees to cook us a lunch of rice and dal for fifty rupees. We set off on foot with full bellies and backtrack towards Purne until we reach the turn off down the steep track to the bridge that Peter crossed earlier that day. The two and a half hours hike to Phuktal is stunning in the late afternoon light. 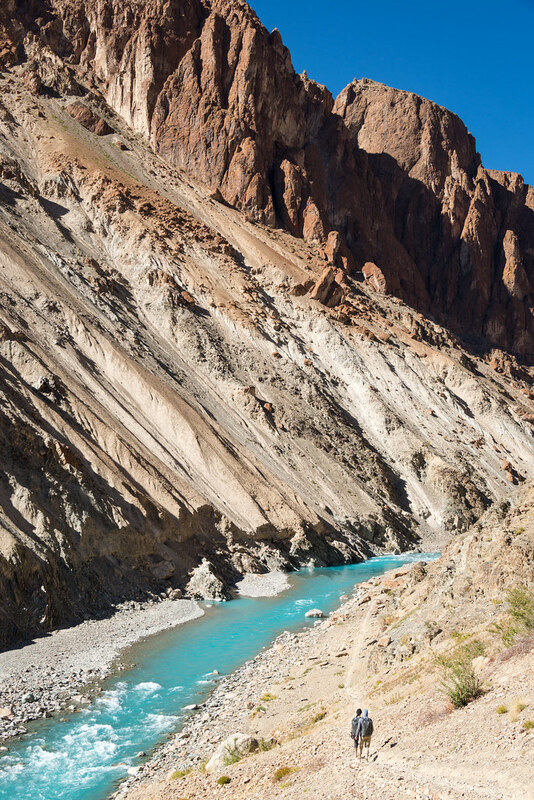 The bright blue Tsarap river offers a stark contrast to the surrounding arid mountains. If only the water wasn’t so cold, I would jump right in… After crossing the river over another shabby-looking bridge, we arrive at a guesthouse, just half a kilometer before the monastery. Outside, a man is enjoying a bucket shower in the sun. 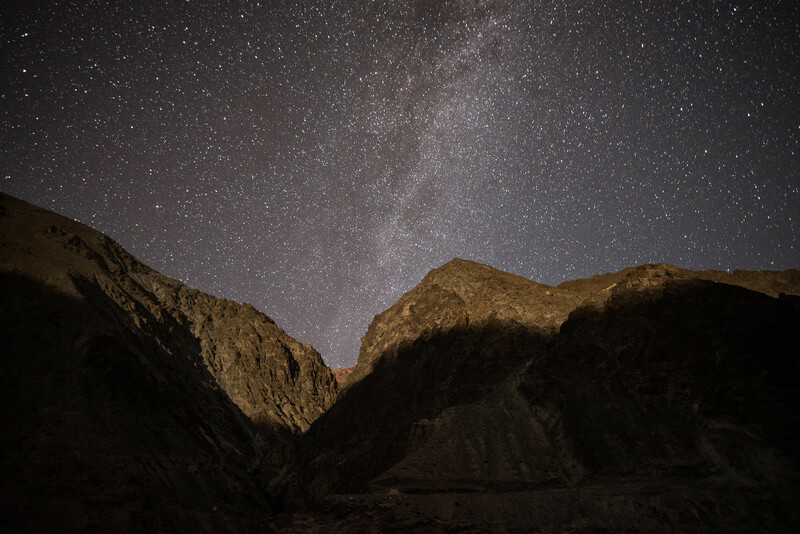 His name is Arnaud, from Paris, and he is hiking solo through the Kashmir mountains. The rooms are en-suite but rather expensive and grubby, the bed sheets look and smell like they haven’t been washed once this summer. Brigitt and Ivo decide to camp outside, which seems like the most hygienic option. I would too, but my stomach still feels delicate so I decide to take a room and remain close to the toilets. At this point we still have about two hours of daylight left, so Brigitt, Ivo and I make our way to the monastery. 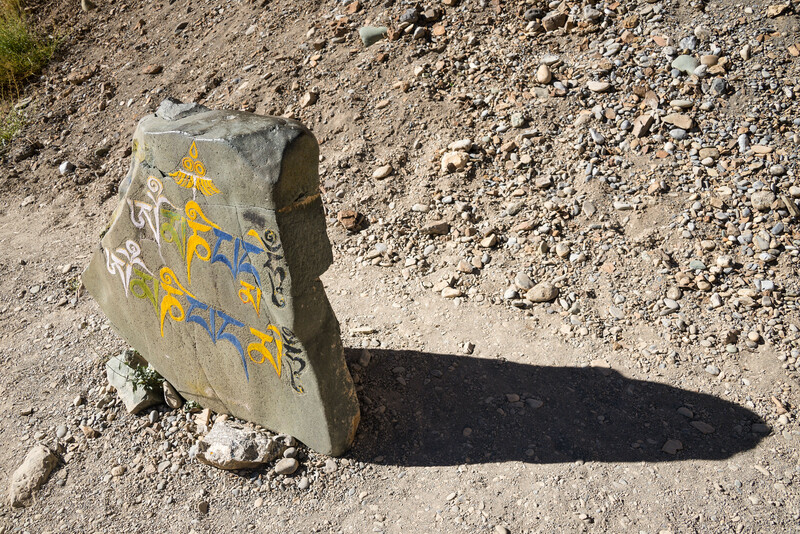 As we meander aimlessly through the many corridors of the gompa we bump into a llama. He looks slightly surprised to find us there at this time of day, but agrees to take us to the different temples of the complex. 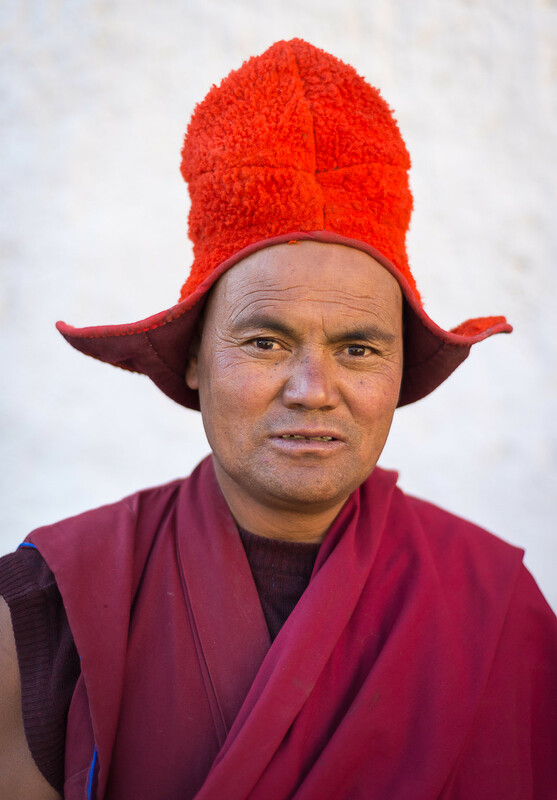 Stophel, who has a son studying and living in the monastery and knows the place quite well, will tell us later that this man is the gompa’s head llama. Built high up on top of a steep cliff around a natural cave, Phutkal is certainly quite an impressive sight when you first lay your eyes upon it… But the inside isn’t so glamorous. 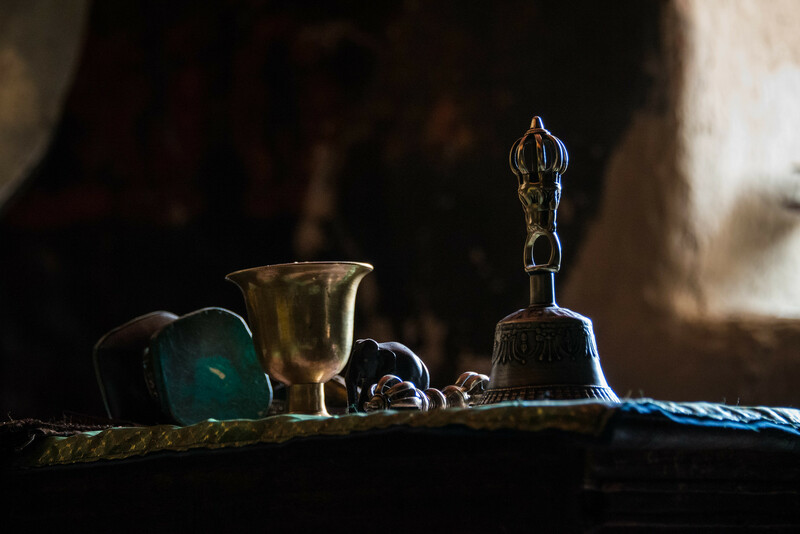 Many of the mud and timber buildings are dilapidated, some of the dark corridors smell of urine and a fair amount of rubbish lays forgotten on the rooftops. As a very wise friend of mine would say “this whole complex is good from far but far from good”. Yet there is something fascinating about this place. 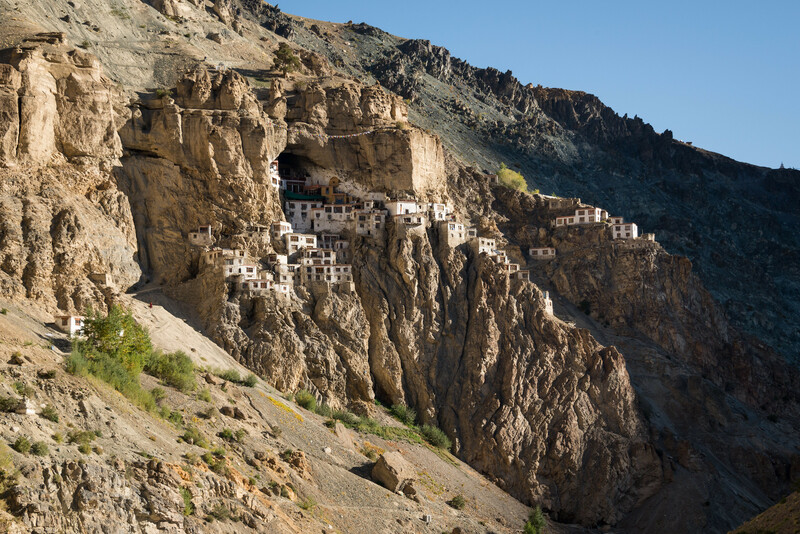 It is the one monastery in Ladakh that can only be reached by foot and its monks live here in total isolation and peace. I am glad I got to see this famous India landmark with my own eyes, it had also been on my bucket-list ever since I started planning the trip. It is seven thirty in the morning and Arnaud, Brigitt, Ivo and I are sitting at the dinner table. 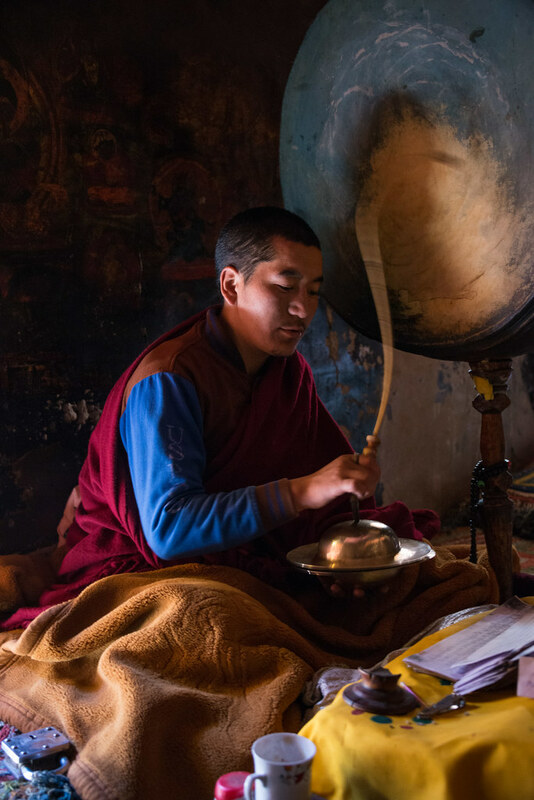 We had asked for breakfast to be ready for seven, but the young monk who is in charge of the guesthouse doesn’t seem to be in a hurry like us. We have another long day ahead of us and we want to leave as soon as possible. We gulp down our omelette and chapatis and start the hike back to Yal, leaving Arnaud behind. Once back in Purne we all agree that we could definitely do with a second breakfast. 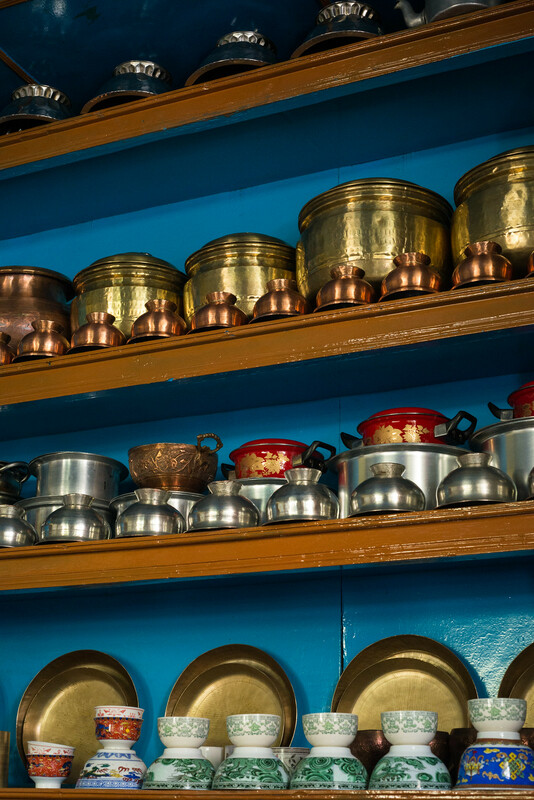 We find a little dhaba where an old lady says tells us that she can get chapatis and eggs ready in a jiffy. The atmosphere in the tiny village is serene and peaceful. While we wait I watch the the sweet old lady prepare the chapatis from scratch. It has a nice soothing effect on me. The food lands on our plates almost an hour later. Typical, but who cares! 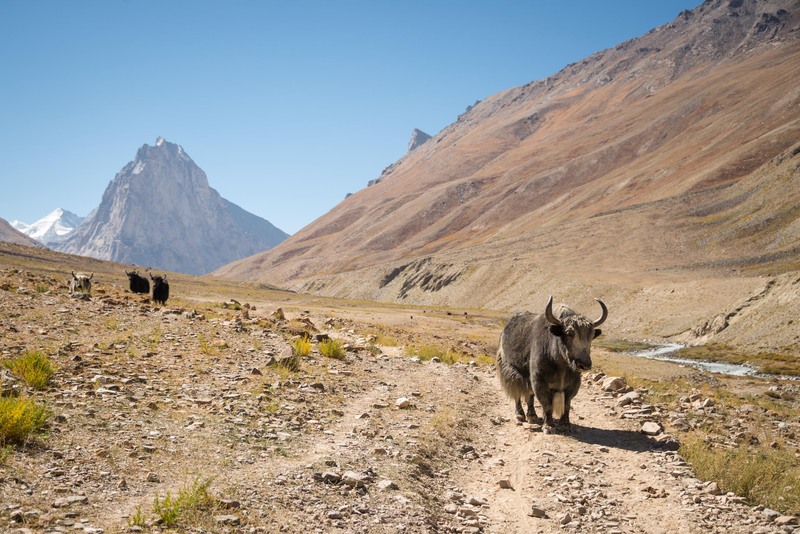 The sky is blue, the birds are singing, the yaks are yaking and everything is fine. 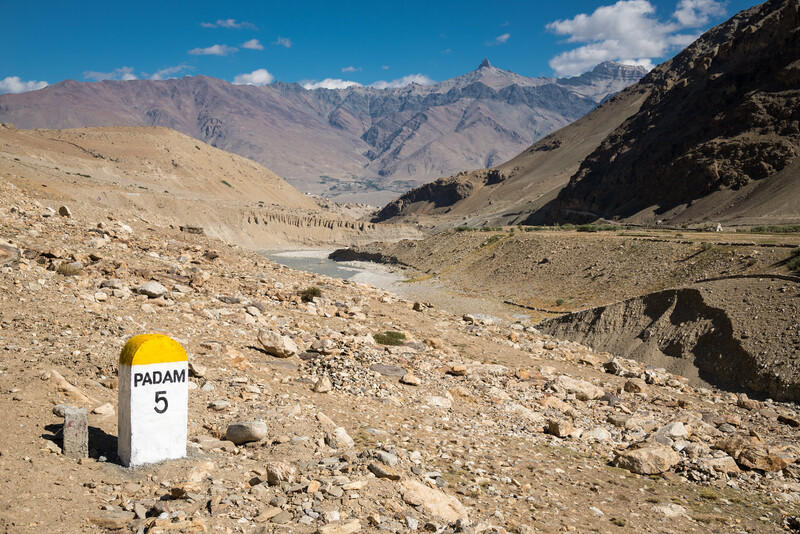 Well the woman who wasn’t looking too good on the same day made it all the way up to Shingo-La and down to the Dhaba at Lakang Sumdo… and the all the way to Padum- Kargil- Leh. You missed to mentioned elderly swiss couple…. But definitely the meeting and the information give by you and the other Swiss couple helped a lot. Your blog is interesting and good pictures! I don’t remember the elderly Swiss couple that you mentioned though. Were they also cycling? I just remember a German couple from Heidelberg hiking down towards Darcha. Anyway, thanks for your comment, and a wonderful year to you too! Any new adventures planned? Schöne Grüße aus München! Yes. we are the couple, and we are elderly… My wife was not so happy about your comment, but your observation is not so far off. Before we meat you and also Ivo&Brigitt we were without success looking for horses and we did not know how the road continued on the other side of the pass. 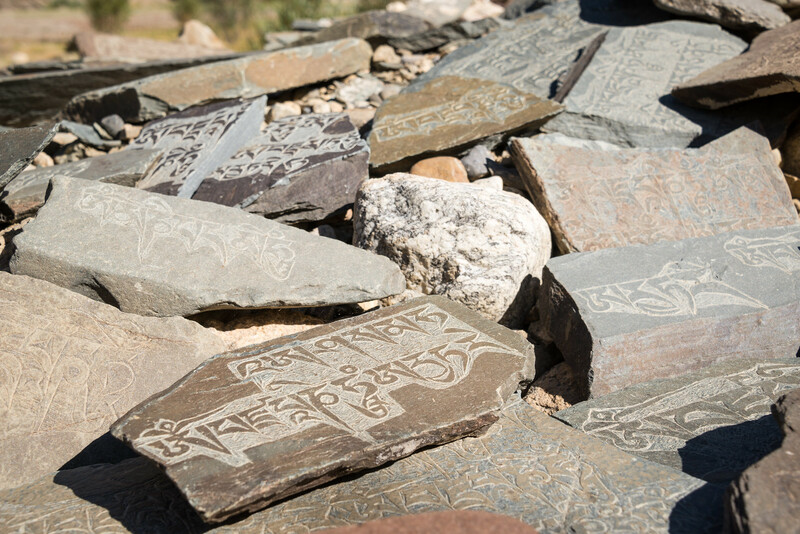 The new information about the road and the camps gave as new energy to continue. Great write up. Planning to do this soon. Maybe solo.It seems stay should not be an problem. Which time did you go. Also can you share any no for hiring horses ( Stophel) or anyone else.. Absolutely wonderful photos. A rather mundane question, but what time of year were you there? 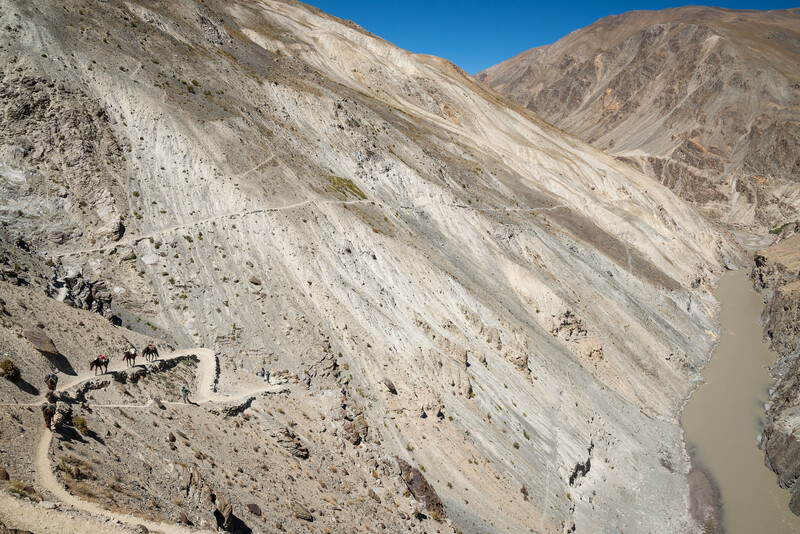 We’re looking at riding a similar route from Leh from mid September. Hi Andy! Thanks for your nice comment. I did that trip during the first 3 weeks of September 2017. Mid-September shouln’t be a problem! You’ll have a blast, it’s such an amazing part of the world. Most excellent. I can’t stop looking at your photos. They’re just so good! it by bike? kan you possible send me an email from the two Swiss who did it (Darcha -Padum)? or you can give them my email asking them to contact me: i would be very very helpful. 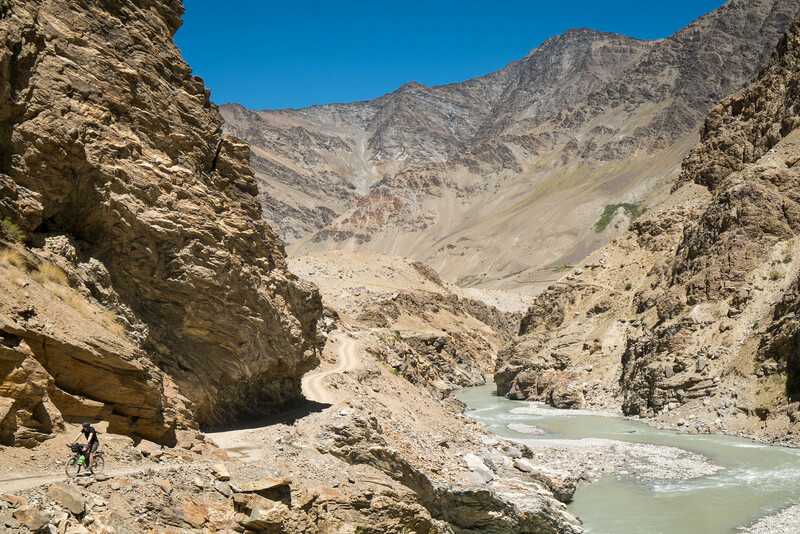 I’m Yoshi, planning a bike trip through zanskar. 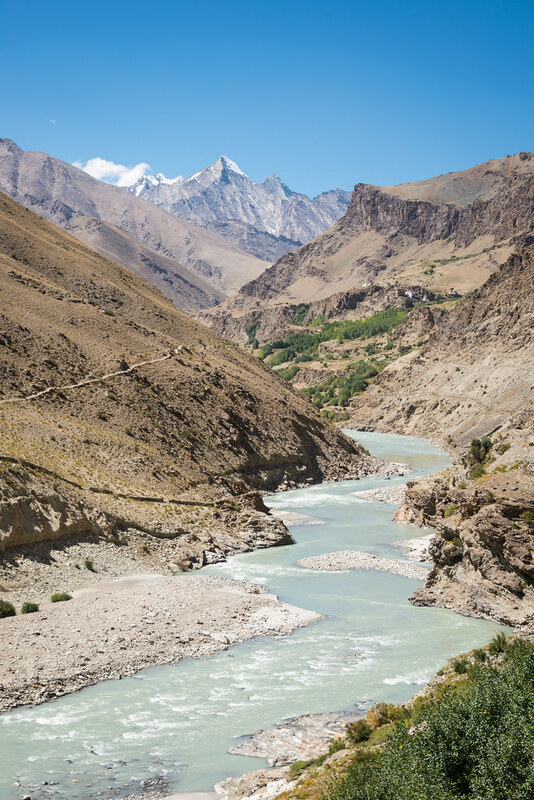 I’m planning to cross the shinku la from darcha to padum, then to kargil by bike this August. I would like to do that with panniers. Is the shinku la road wide enough to push my bike with panniers? I don’t want to use horses, just by myself. Could you send me an email? It helps me a lot.